Home » » NAFSO launched an island wide campaign against destructive fishing practices. NAFSO launched an island wide campaign against destructive fishing practices. The destructive fishing practices are one of the biggest threat to the lives and livelihoods to the small scale fishers as well as the sustenance of the fish resources in the country .NAFSO has been fighting against this and pressurize the government officials and politicians to enforce the existing law on the same. The Gazette notification of 1985 by the Minister of Fisheries is the key instrument to control over the destruction and NAFSO's demand was to enforce the law all around the country. However, the authorities are deaf and blind to the situation and no law enforcement was occurred though the politicians, government authorities gave serious promises several times since 1987. Recently, NAFSO launched a series of dialogues with the MOF of present regime and we received the same treatment and there was no change with the law enforcement. In October, 2006, April and October 2007, NAFSO representatives received the same promise from the present MOF and there was no change happened as a result of these dialogues. All were broken promises and fisher people are utterly frustrated. However, NAFSIO and the members did not give up the hope. They continued the dialogue as well as voice out where ever possible time comes. 21, November the fisher people celebrate the World Fisheries Day every year and voice out their demands for their survival and sustenance. Last month, NAFSO and the membership celebrated the WFD and the destructive fishing and the livelihood secirty was the key demands among fishers again. People voice out the immediate action by the authorities and they highly highlighted their frustration over the government authorities’ inactiveness to our demands. As a result of the dialogue among the NAFSO leaders and the fishers at the WFD on 21st November, the group agreed to campaign further to take action to stop this illegal fishing. 28 Puttlam fishers got together at Daluwa where the Deputy Fisheries Minister's house and demanded to immediate action to stop this. After very serious and lengthy discussions amidst various difficulties, deputy minister gave a letter which addressed to the DFEO at Puttlam to take immediate action to arrest illegal fishing. The discussion NAFSO leaders had with Kandakuliya, Thalawila and Baththalangunduwa fishers, NAFSO wanted to take some legal actions against authorities, after two weeks time from 30th November. Now, 10th December, NAFSO has taken decision to meet all the DFEO officers and inform them to take legal action against the Illegal fishing and pressurize them again as a collective action. We expect to launch this island wide and want to implement the next steps to keep the people aware on the situation. So, 10th December is a decisive date for the fisher people who are suffering from the destruction and also it will be same to the officials too. The fishers will take strong actions forward unless 10th December action will be a fruitful and officials will take steps to stop these destructions immediately. We will report the results of the campaign and will seek assistance from you all as the next step. The Small fisher groups met DFEO officers at Tangalle, Mathara, Galle, Kaluthara, Negombo, Puutalam, Trincomalee and Kalmunai Areas demanding law enforcement on destructive Fishing practices in Sri Lankan waters. Officials agreed their demands with leaders and raised the difficulties to law enforcement in the field. Puttalam District Fisheries Solidarity had taken the responsibility to meet Puttalam District DFEO for aware him to take immediate action to stop this illegal fishing practices in the district in this island wide campaign. District DFO Mr. Anura Jayasekara talked with fisher leader and explained their difficulties that they face to take legal Acton on this matter. DFEO further told that they don’t have enough officers to cover the field. According to the puttalam district organization he agreed to act fast since next couple of weeks as a result of this discussion they had with DFEO Mr. Anura Jayasekara. At the end of the discussion DFEO agreed with fishers to take help from the Navel forces and police in the district and this matter will be discussed at the District Development Committee Meeting this week to educate district authorities on this matter. Around 25 fishermen and district fisher leaders participated in this work to make this is a successful one they had handed over a memorandum to the DFEO asking his solution on this matter. Puttalam district DEFO said that they have filled 13 court cases against this matter in the district. NAFSO Gampaha District Partner Organization, Negombo Sri Vimukthi Women Fisheries Organization lead fishers to hand over the memorandum to Negombo DFEO Mr. Ranjith Bandara with the help of Negombo Lagoon Fisheries Organization. 12 fisher women and fisher leaders participated in this occasion. At the beginning of the discussion he asked fishers what are the places, in which illegal fishing practices are operated by fishers. Replying him Mr. Markas Fernando , the coordinator of Lagoon Fisheries Organization pointed out inefficiency of fisheries officers in the district and he forced them to act immediately to prevent this condition in the sea. DFEO further asked help from the fishers to inform them when illegal fishing practices launch in the sea. Additionally DFEO promised to meet Sri Vimukthi Women Fishers Organization again to hold an awareness programme next year as a result of this work to discuss further how to involve with fishers to educate them regarding these illegal fishing practices and stop this. Kaluthara District fisheries Solidarity and district fisher leaders met Kaluthara District DFEO to discuss this matter to force them to take an immediate legal action, according to the gazette Paper, which issued 2005.06. 05 notifying to take legal action against illegal fishing practices all around the country. More than 20 fishermen and some other KDFS officials participated in the discussion. According to the district coordinator DEFO failed to present his solution for this matter as a responsible authority in the fisheries sector. Therefore fishers suggested him to take immediate action to stop this illegal fishing in the sea. Finally DFEO agreed to help act this law against illegal fishing practices to protect the sea and fishers will help them giving necessary information to arrest people, who use banned fishing gears. Finally fisher leaders handed over a petition demanding to act fast before fisher come to streets for fighting their rights. According to the District coordinator of Southern Fisheries Organization Galle Mr. Gnanadasa, 18 representatives have gathered to meet DFO but he hasn’t been in the office when they go to meet him. Therefore they have had to discuss this burning issue with two other fisheries officers, Mr. Gajanayaka and Mr. Nimal Wikramasingha. They have agreed that they would talk with DFO and to take immediate action to stop these destructive fishing practices in the southern sea. Southern Fisheries Organization Galle will work with this issue with district fisher leaders any further to. The main key demands of the Southern Fisheries Organization Mathara were stop illegal fishing practices in the sea, Take immediate legal action against those who use illegal fishing equipments mentioned in the gazette Paper, which issued 2005.06. 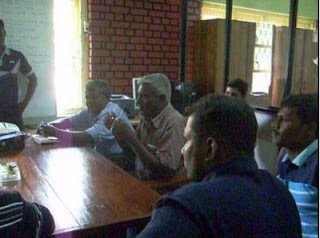 05 like Dinamites light course in the southern sea belt at the discussion had with Mathara district new DFEO Mr. Palitha. SFO Mathara hand over a memorandum with 500 fisher’s signatures against illegal fishing practices and 20 fisherman and NAFSO leaders attended this discussion with DFEO. According to the source, DFEO agreed to arrest even catched fish as well as when they transport with a vehicle using such an illegal killed fish. DFEO has promised to aware the other responsible authorities too in this regards since next couple of weeks. Dinamite and light course are major threats in this area according to the Ruhunu Diriya Fisheries Organization, which is mainly working with small scale fishers in Tangalle against destructive fishing practices in the area. RDFO also decided to join with this island wide campaign with fisheries leaders handing over a memorandum to DFEO Mr. M.A. Premadasa, Tangalle demanding legal action to stop DFP in the sea. DFEO requested help from fishers to taking information regarding these illegal fishing gears to take legal action on that. In addition to that he emphasized that they have no enough resource to arrest them in the sea like boat facilities. But already DFEO have discussed this matter with Sri Lankan Navel Forces and police to help them to take legal action against those who are using illegal fishing practices further added DEFO Mr. M.A. Premadasa. Finally he agreed to take immediate action for this matter discussing with ministry of fisheries. 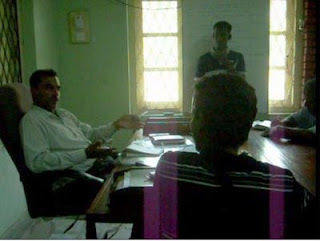 15 fisher’s leaders had participated in this work with Ruhunu Diriya Fisheries Organization. In the eastern province of Sri Lanka Tricomalee District fisheries Solidarity lead this campaign with the help of fisher leaders of district cooperative fishing societies for handing over this memorandum. Trincomalee DFEO Mr. Rohitha accepted this paper and he promised to take all the legal action on behalf of fishermen. According to him they have no enough filed officers to cover the field through the district. We conducted this discussion around two hours and pointed out how fishers face this difficulty in the district. As a result of this discussion he promised us to attest all those who are using illegal fishing gears with the help of navel and police forces. He further added in the future they will discuss with Sri Lankan security forces to taking their service to prevent this destruction in the sea. Participated fishermen suggested displaying notice in the fishing areas enforcing the low on destructive fishing practices in the district.